There are many reasons why a bookcase or tall shelving unit might be unstable. From the floor it’s standing on to irregular legs there can be many reasons you might need a furniture leveling shim. So if your bookcases lean against walls, don’t worry, we can get them leveled and safe! When decorating your home, sometimes you can go get the rug that fits perfectly, but sometimes you have to work with what you’ve got. If that means the rug doesn’t fit perfectly and the bookcase is going to partially rest on it, you will have an unbalanced bookshelf. Instead of going out and spending several hundred dollars on a new rug, you can just fix the lean! Place a level on the top of your bookcase, if the gap is big enough to need two wedges, use a soft plastic Wobble Wedge on the floor with a hard plastic wedge on top. The hard plastic wedge will give stability and the soft plastic will help dampen and “stick” the bookshelf in place. Use as many wedges as needed to bring the bookshelf up to level. If your bookcase is leaning because it has a leg that is too short, Wobble Wedge® plastic shims are great for fixing this problem too. Soft plastic Wobble Wedges will protect delicate wooden bookshelves from dents while allowing you to level the shelf on hard flooring, like wood or tile. If the bookcase is on carpet, you’ll want to use hard plastic Wobble Wedge shims to give stability while stopping the wobble. Remember you can stack Wobble Wedges because of their patented interlocking ridges, and they won’t slip! So if you need the soft plastic to protect the wood of the shelf, you can stack it on top of a hard plastic shim and they won’t budge. 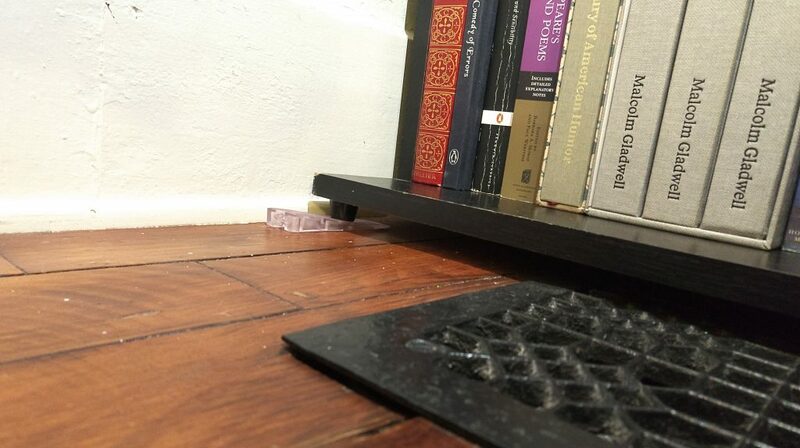 If your bookcase is resting on a vent or grate, that can definitely cause instability. Obviously, it’s not ideal to place any furniture on top of a vent, as it will restrict air flow, but if it’s gotta be there, we can help. Place a level on top of your bookcase and add shims until it’s level. Big Gap Wobble Wedges can fill a space up to .48 inch, and standard Wobble Wedges are .25 inch thick, so you can mix and match to get any height you need to stabilize your shelving. Remember that you should always anchor your tall shelving to the wall if the manufacturer recommends it, this is especially true if you have young children or pets that might try to climb the furniture. 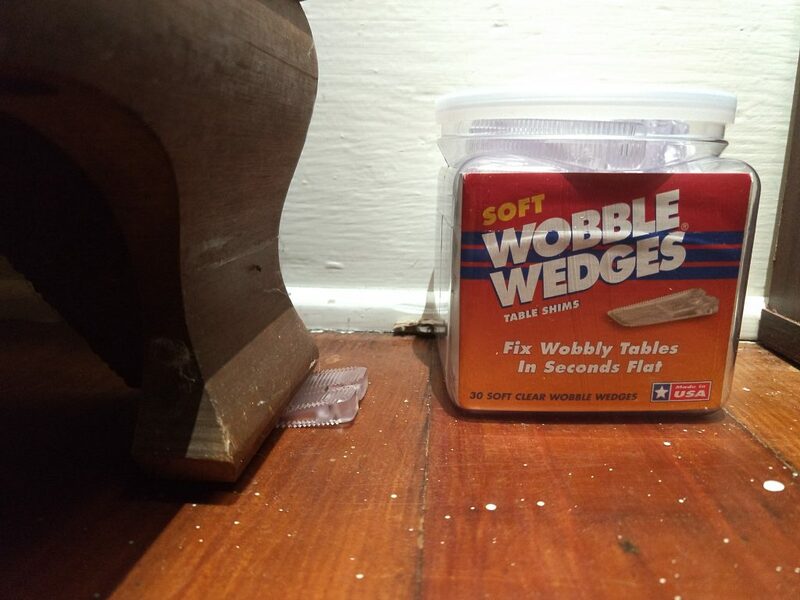 We recommend leveling your furniture with Wobble Wedges before you anchor.